I first got intrigued by It Must've Been Something He Wrote by Nikita Deshpande because of the teasers I saw on twitter. So when I got an opportunity to review the book, I jumped on it. It is safe to say that I went into this book without any expectations. I think that is what made this book SO amazing of a read for me. It really blew me away by how funny and heart warming the book turned out to be. So basically this is Amruta's story. Ruta is originally from Pune (shout out to all my Pune peeps!) and she now lives in Delhi working as a marketing executive for Parker-Hailey's Publishing. Ruta was a fairly simple girl. She was sweet and extremely easy to relate to. Her passion for all things bookish and to finally find her place in life and her career is what made her such a real character to me. Ruta had her own set of vulnerabilities and insecurities and it was nice to see glimpses of them like any normal person. Ruta's journey trying to make it is not easy. Her boss expects miracles out of her when he actually can't even get her name right. Her crush is not reciprocating the way she would like him to and to top it all off she is stuck with Jishnu Guha, the bestselling author of seven super duper cheesy romances whom she can't help but put her foot in the mouth with. I loved Ruta and I loved the relationship she shared with Jish. What starts off as an annoyance soon turns into a friendship and before they know it, into something more. Jish and Ruta both have issues to deal with. They are both hesitant and unsure but circumstances or fate always pulls them together. This book at the core is Ruta's journey but I have to say I very much enjoyed the romance part of it. More people I loved in the book were Jyo and Bunts. These two were just HILARIOUS. There were so many instances during the book that I was laughing out loud. Ruta's family was another whimsical bunch and they just added more to the story. 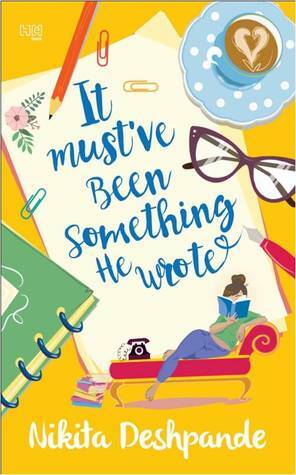 With a strong protagonist and an amazing bunch of characters Nikita Deshpande pulls off a brilliant debut. I will most definitely be on the look out to read more from her. It Must've Been Something He Wrote was an awesome read! Go get it! *Note: A copy of this book was provided by Hachette India in exchange for an honest review. We thank them. Sign into Goodreads to see if any of your friends have read It Must've Been Something He Wrote.